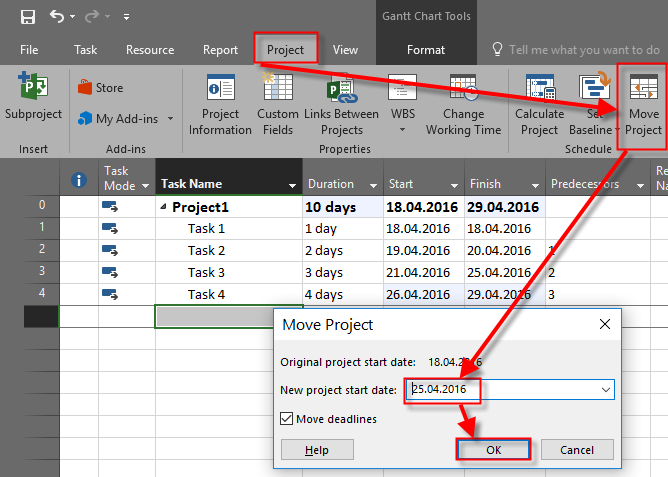 Is it possible to make a Project plan without Project Start Date in MS Project 2016! I will show you an example in MS PROJECT 2016, but first I have to give an answer. NO! you can not do it. As you can see I’ve got end date = 29.04.2016, Friday, because all days are working days, there is no Resources with their Calendars, or any other exceptions other than Weekend (Saturday and Sunday). Microsoft Project will always calculate End date (if your Project is scheduled from Project Start Date), or Start date (if your Project is scheduled from Project End Date). all of this must be taken into consideration when calculations. So, without dates (e.g. Start Date) it will be impossible for Project for making right Schedule. and move whole Project to new Start Date (like, in my example, to 25.04.2016). But be aware that you enter all exceptions before that (for example if you have Holiday at 26.04.2016, put it in exceptions)! then you will get your right Schedule! More about exceptions and Task Types you can se in my previous Blog Posts. This entry was posted in MICROSOFT PROJECT, Micsrosoft Project 2016, MS PROJECT 2016, PMI, PRoject Management and tagged Micorosft Project 2016, Micorosft Project 2016 - Schedule, MS PROJECT. Bookmark the permalink. 1 Response to Is it possible to make a Project plan without Project Start Date in MS Project 2016!